The new top-of-the-line XTS 5000 portable radio is ready and equipped to meet the needs of demanding environments. The most interoperable radio of its class, the XTS 5000 radio is an incredibly versatile Public Safety portable designed for mission-critical APCO Project 25 users. It's Motorola's newest maximum performance two-way radio that is equipped to meet your demands as well as provide a peace of mind with secure communications. The XTS 5000 portable radio is capable of the following: ASTRO 25 Digital Trunking, ASTROŽ Analog and Digital Trunking, and Analog and Digital Conventional. The XTS 5000 portable radio is designed to offer multiple frequency band solutions for perfect system optimization in congested urban areas or wider country regions. Motorola currently offers the 700/800 MHz dual band (764-870MHz), the VHF band (136-174 MHz), and the UHF Range 1 band (380-470 MHz). Future rollouts will include the UHF Range 2 band (450-520 MHz). The XTS 5000 radio is capable of further enhancements such as Wireless Application Protocol (WAP) for database management applications, Alphanumeric Text Service, and External IP data via the high speed USB or RS232 ports. The security features of the XTS 5000 radio include Type I, III, and IV encryption. The XTS 5000 features improve audio quality with the Noise Reduction Software and Audio Gain Control. 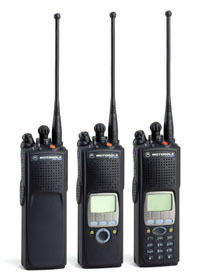 In addition to a wide variety of batteries and chargers, featuring Smart Battery technology and the Intelligent Motorola Portable Radio Energy System (IMPRES), audio accessories, CommPort, speaker microphones, antennas, and carry cases, the XTS 5000 portable is also available with specific surveillance accessories, vehicular adapter, and a Clam Shell Battery. What are the differences between the three models that are available for the XTS 5000 portable radio? Model I offers basic features and functionality with up to 48 modes, whereas Model II offers a bitmapped display and navigation keys for greater functionality. Additionally, Model III offers a bitmapped display, navigation, and alphanumeric keypad for full use of features and advanced functionality. Both Models II and III offer up to 512 user selectable modes for greater user flexibility. Does the XTS 5000 allow for interoperability between system platforms? The XTS 5000 is designed with backward compatibility to allow its users to communicate on the existing Analog Conventional and ASTRO systems, while also being able to operate on the new APCO Project 25 Trunked and Conventional systems. By offering the best solution for seamless statewide coverage, the XTS 5000 is the most interoperable radio ever developed. How important is the Project 25 compliance? The APCO Project 25 is an open architecture digital Standard for Public Safety Government Communications Systems that assures interoperability of P25 equipment from multiple vendors; maximizes spectrum efficiency; provides for graceful migration from analog through future digital technologies with backward compatibility with existing systems; allows effective, efficient and reliable intra-agency and inter-agency communications to scale in size from small individual users to wide-area regional systems. What advantages does the Smart Battery bring? What is the Intelligent Motorola Portable Radio Energy System (IMPRES)? What enhancements does the new WindowsŽ-based CPS introduce? The Customer Programming Software (CPS) provides an improved user interface in a friendly WindowsŽ environment including an easy navigation in a familiar setting; the ability to copy information quickly from one file to another; password protection enhancing security; printable data from within a file; fast, and easy answers to questions; conversion of DOS files into WindowsŽ files; and prevention of incorrect data insertion. In addition to the new accessories that are being introduced with the XTS 5000, what other accessories is the XTS 5000 portable radio compatible with? The XTS 5000 radio is compatible with MOST of the MTS 2000, XTS 3000, XTS 3500, and XTS 2500 radio accessories including XTVA and XTS Public Safety Microphones. Multiple encryption software packages can be ordered simultaneously. Multikey is REQUIRED when using more than one encryption algorithm or encryption key. Q159 REQUIRED. NOT compatible with Q629 and Q625. Must order multikey if you want to use both algorithms. REQUIRED for ALL Encryption Algorithm or combination of Algorithms listed on page. *DES/XL Secure Analog Trunking NOT available. **ORDER at least 1 Encryption Algorithm Option, which is REQUIRED. *AES Encryption compatible with digital operation ONLY. SUPPORTS up to 4 Algorithms. Q159 Required!.This note only applys to VHF & UHF (NOT 700/800). OTAR is NOT COMPATIBLE with TYPE 1 (Q374 or Q400). Q159 REQUIRED. This note only applys to VHF & UHF (NOT 700/800). OTAR is NOT COMPATIBLE with TYPE 1 (Q374 or Q400). Quick feature provides access to Call Alert, Status, Message, Selective Call, or Telephone Interconnect.